This game, played between Sugiuchi Masao (9p) and Fujisawa Hosai (9p), involves a mirror go where two ladders were played almost all the way to the end. 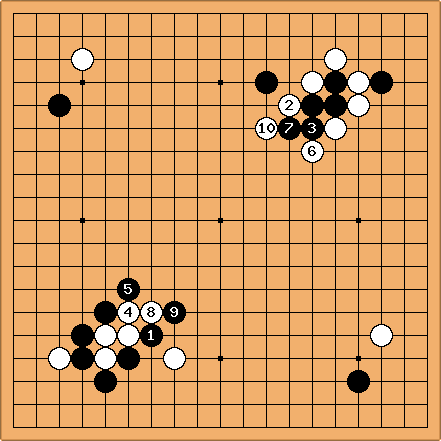 It is mentioned in Kageyama Toshiro's Lessons in the Fundamentals of Go as a game that will "go down in the annals of professional play as an all-time freak". You can see the complete game at the GoBase Replay Service ( http://www.gobase.org/service/uncgi/bin/replay-sgf?gam=/games/japan/titles/meijin-old/1/game-l46.sgf&off=null). Sharp readers might realize that this game is almost identical to the second example of countering mirror go.